Interesting Facts The Golden Leaf Casserole came with an unusual cradle called a “mounter,” also available with the Brown Hex Signs pattern released in 1958. “Just add your love and Christmas Greetings!” stated the 1960 Holiday promotional advertisement. The Golden Leaf Casserole was released on the four-quart Mixing Bowl (404), which included a clear lid with knob and cradle. 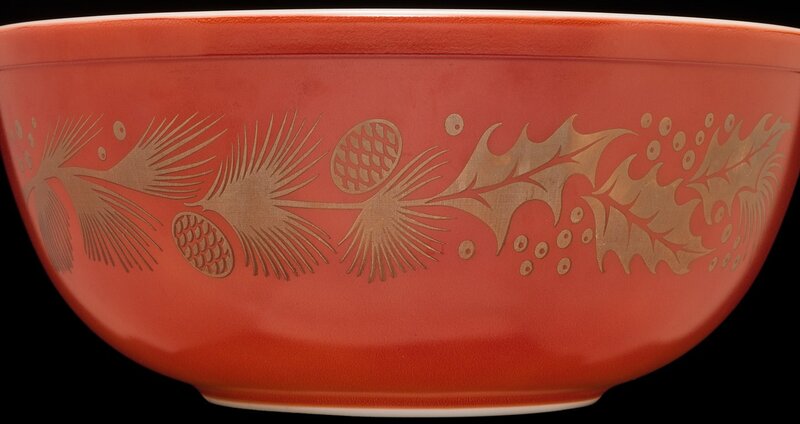 The pattern was printed on a red casserole and featured a design of gold leaves, pinecones and pine needles.